Wake up! You are not dreaming. This is really happening. Well, in Japan at least. 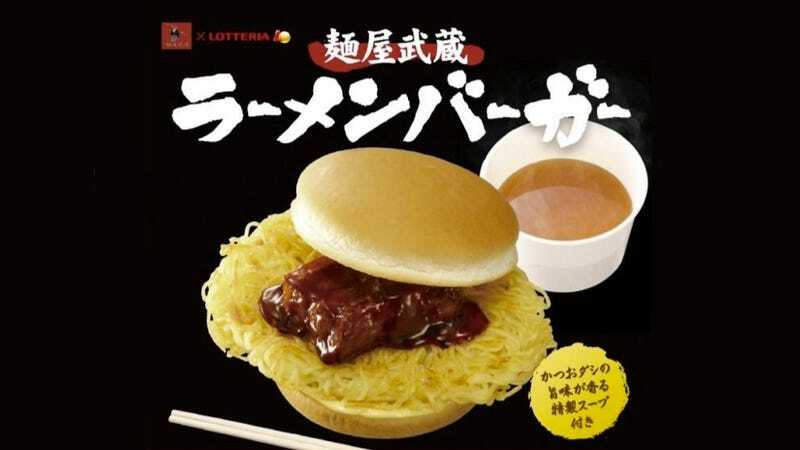 Fast food joint Lotteria is teaming with ramen restaurant Menya Musashi for this culinary collaboration—a first of its kind, apparently, for the hamburger chain. Thus, as IT Media reports, the resulting burger is called "Menya Musashi Ramen Burger". The noodles are lightly fried into a ramen patty, which is placed between two burger buns along with tender pork cutlet and mayonnaise. The burger is also served with "katsuo dashi" (a type of Japanese broth) soup. Priced at 634 yen (US$6.30), the limited time only burger with soup is available starting May 20. You can even order a second ramen patty for only 100 yen.